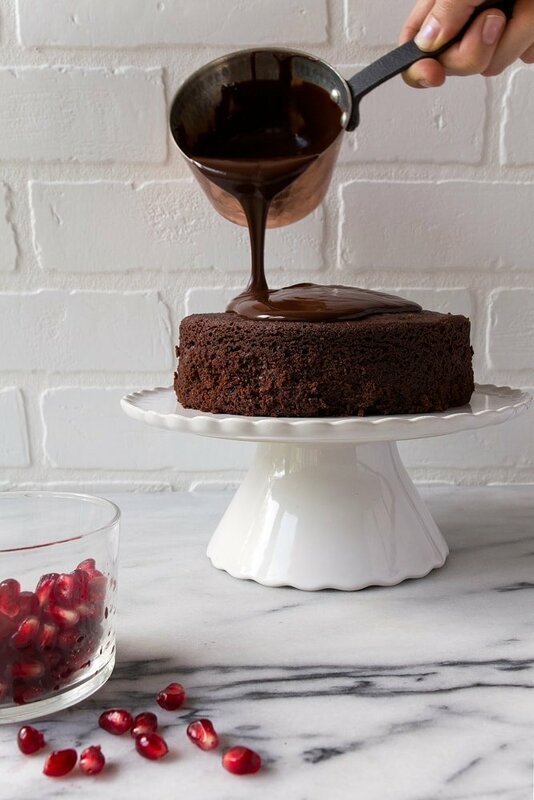 Mini chocolate cake for two; perfect for celebrating anniversaries, date night, or just because: chocolate. The last time I made this mini chocolate cake for two, we ate it in the car on the way to dinner. And if I remember correctly, we had burgers and fries. It’s not that this cake is ‘light’ or ‘not too sweet’ or whatever it is that people say about dessert to make them feel less badly about eating it. It’s a solid, rich chocolate cake. The cake has a crumb that is one notch closer to pound cake than boxed cake mix, which I love. The ganache on top is my obsession. I almost never remember to put butter on the counter to soften for cake frosting, and a 2-minute chocolate ganache solves that problem. The pomegranate seeds are just, well, pretty. And crunchy. And tart. And very welcome. It’s just that, I always have room for dessert, even if it’s at the beginning of a meal. As it turns out, my grandma was wrong: eating dessert before dinner does not spoil your appetite. Just like how going to bed with wet hair won’t give you pneumonia. (She always said that). I’m going to help you out with all of your Valentine’s Day dessert for two needs, but first: you’re going to need a 6″ cake pan. They’re adorable. And once you buy one, you can make allllll of my mini cake recipes. (Plus, I even use it to make a small batch of fudge, too!). When you bake small desserts, you can have more desserts in your life. <–I think I’m going to run for office on that slogan. And to win the votes, I’m going to let you put your face under that cup of warm, melted chocolate. Sound good? Quick note: You want this exact –> 6″ cake pan with the 2″ sides, not 3″ sides. A small chocolate cake that serves just two people. Preheat the oven to 350, and position a rack in the lower third of the oven. Line a 6" round cake pan (with 2" sides) with parchment paper on the bottom, and lightly grease the sides with oil. In a small bowl, whisk together the oil, sugar, sour cream, egg, vanilla and coffee. Combine the two bowls, mixing just until combined. Pour the batter into the cake pan, and bake for 29-32 minutes, or until a toothpick inserted into the cake comes out clean. If you under-bake the cake, it will slightly sink, so check it! It will also start to pull away from the sides when it's done. Remove the cake from the pan by carefully tilting it into one hand, peel off the parchment from the bottom, and then place it on a small cake stand. In a double boiler, or bowl fitted over a pan of simmering water, combine the chopped chocolate, cream, and corn syrup (if using). Stir over medium heat until melted and smooth. *Alternatively, you can melt the chocolate and cream in the microwave in 25-second pulses on LOW power. Stir between each pulse. 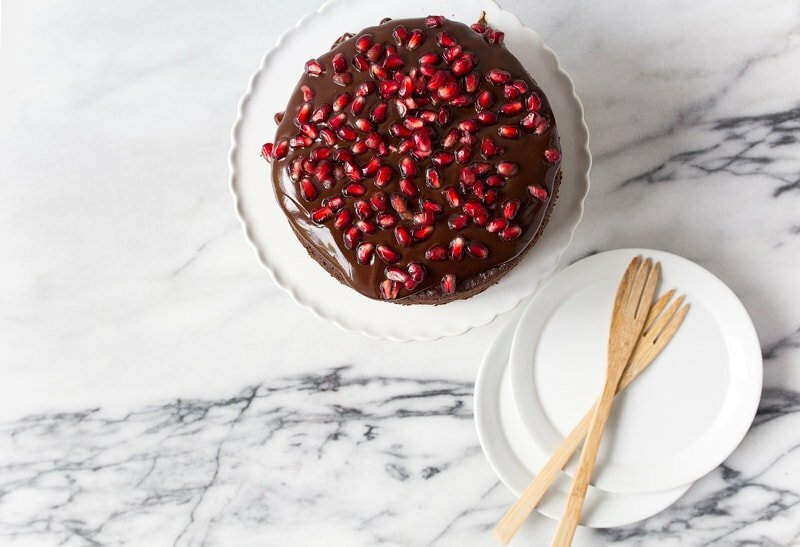 Pour the chocolate over the cake, and garnish with pomegranate arils. I tried to make this substituting coffee for warm water and without the sour cream since nobody in my household consumes or uses those things, and the cake didn’t rise at all – for some reason, whenever I make cakes (and I don’t always substitute things but still) they don’t rise and they don’t really work except for your angel food cake in a loaf pan which i LOVE, thank you for that! Do you have any advice? I love to bake but I’m not very good at it .____. I’m not sure if you’re the same person that asked this on Facebook, but I’ll repeat it here. Sour cream has significant acidity that contributes to the rise of a cake. Acids react with leaveners (baking soda/ baking powder) in the batter to make a cake rise properly. Milk does not have this acidity. Also, sour cream is somewhere around 14% fat, which contributes moisture to the cake. Substituting milk really doesn’t work because it has anywhere from 0% (skim milk) to 3% (whole milk) fat content. If most cake recipes fail for you, I’m wondering what’s going on here :( I wish I could get in the kitchen with you. There are so many intricacies to baking, and the more you do it, the better you get at it. This recipe has a how-to video with it, have you watched it? It covers everything from the best way to measure ingredients for baking, how to mix without over-mixing, how to prepare pans, and tips for knowing when a cake is done. Have you ever taken a cooking class? When I first decided to become a recipe developer, I took a few one-off courses just to learn from the pros exactly how to measure and bake. It might be a worthwhile investment, since it seems like you like to bake? Anyway, best of luck! And let me know how it goes! I’m happy to answer any more questions you might have! The reply you got about acidity being needed… you can substitute plain Greek yogurt (it’s wonderfully thick as the whey has been mostly strained out)… for the sour cream. Also never over beat! Fold in the ingredients together, don’t over mix. As soon as the liquid absorbs all the dry ingredients you are done. Good luck! Can you tell us why you call for the 6″ pan with 2″ sides and not the 3″ sides? Isn’t the 3″ sides more versatile? You can double the recipe and use those bigger pans but just be sure the batter fills them at least an inch from the top. And I’d like to thank everyone here for all these great tips!!! Can’t wait to try this! You look adorable!! This looks great! Just curious if the coffee is absolutely necessary? We’re tea drinkers so we don’t keep any in the house. Thanks! I made this for my friend’s 11 birthday, (now that we’re in 6th grade I wanted to do something special) and I didn’t use the coffee or substitute it for anything else. It still tasted amazing, and I am happy with the result. It was also the perfect consistency. I adore your recipes. I have not made one that I did not thoroughly enjoy! I cannot wait to make this one. I love my 6 inch pans! Thanks for keeping them baking with delicious recipes ???? Mini cakes are fantastic. I agree, you can have more desserts in your life with smaller ones! We are also tea drinkers in my household but I love putting in a dash of coffee into chocolate cakes. I wouldn’t even think of leaving it out. 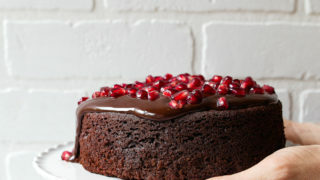 I’ve never added pomegranate to a choc cake but I like the idea of it. Hi Mich! Cool pans! These pans look really shallow, so I’m not sure if my recipes would work for them. Did it come with a recipe booklet? I made this today. Was absolutely delicious! Followed the recipe as written. Didn’t change a thing. Will definitely make it again real soon. Would you add anything more if you used light sour cream…because its too snowy to go buy full fat? ???? I’m so excited to try this! 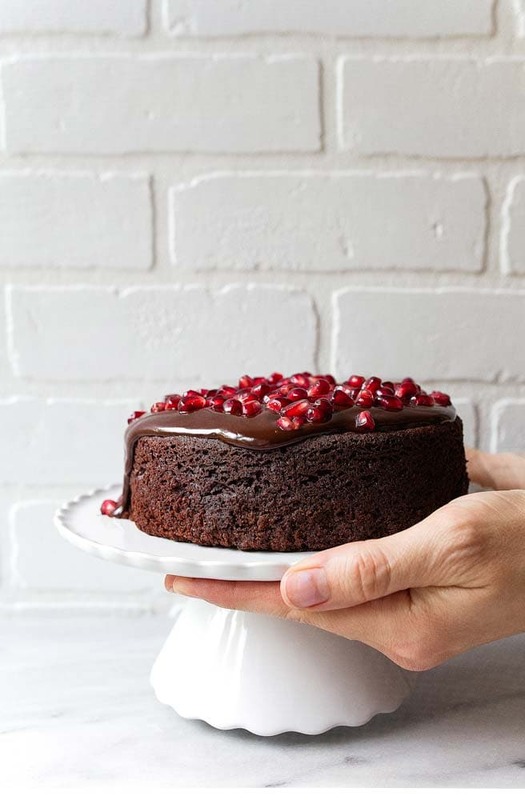 The Perfectly Chocolate Chocolate Cake is my go-to recipe, so I can’t wait to try your adaptation, and in a small size, too! While I’m here — do you have plans to be teaching any more classes in the St. Louis area this year? At this time, I do not. I’m sorry :( I’m working on book #4 and just don’t have time for classes right now. Then I will keep an eye out for the book! Thanks for the reply! such a pretty little cake and ooooh girl that ganache on top is everything! Such a beautiful cake! Can I double this recipe? I have a 9 inch round cake pan, would that work or would I need something bigger? Great recipe. I used warmed molasses instead of the coffee as my husband won’t touch anything with coffee in it. It worked wonderfully. I am going to try the carrot cake next as I just love the 6″ cooking tins. I have ordered your cookbooks so can’t wait to try other recipes. A note to anyone who is making this cake, use the sour cream. I didn’t and I assume that’s why my cake looks like Niagara Falls. Just chanced upon this and am delighted with all your recipes which are perfect for two! Because really, there are only two of us at home plus my husband ain’t that much of a dessert fan. The small portions will be perfect. Can I check if olive oil or vegetable oil are neutral oils? And also if the full fat sour cream can be substituted with low fat or light ones? The cake turned out good…and it was quick. I frosted it with chocolate frosting and almond shavings. Made this for my Honey tonight! Can’t wait to surprise him❤️ It’s so cute! I used raspberries instead. I would like to try this recipe, but I just wanted to make sure first about the cup size: in several blogs I see a cup is 100 grams and in others, a cup is normal 225 grams. Which is the size in this case? I have tried always with the 225 grams cup size, but in some cases I have found out the hard way that it was not 225. I did try with taking half a cup of a 225 grams-cup (as in online-calculators). The cake looks beautiful, it is just a biiit dry. Maybe I should try again with less flour. For us metric scale users that’s ????????????. Cup measures make me nervous ???? Tried out your recipe and my friends and I loved it! Love this! Do you thunk I could make a few days ahead, freeze, thaw and add the ganache? Can’t wait to try it! Hi, just wondering if I could use full fat yogurt instead of sour cream? Thanks. Please can you do a version with butter instead of oil? This recipe looks really simple and delicious. I do want to try it. But as I don’t bake often I don’t want to buy a cake tin. I do have a lot of glass pyrex bowls. Can I bake it in that? If so, do I have to change any of the instructions, temperature or time required to bake it? It’s a six-inch glass dish. So it’s a similar size to the pan in the recipe, except it’s a pyrex bowl. I did this cake in a pyrex bowl and adjusted the heat down a little and the time up, bc glass and ceramic hold the heat more. Delicious cake!! I put some pandan (green) flavored coconut, toasted coconut and pulverized pistachio on the ganache to make the cake look like a little hill. Thanks for the recipe! Not sure, Ria, I haven’t tried that. I think it would bake up just fine, but I’m worried it would firm up after cooling. That’s why I like oil–it makes a softer cake. 1. Would I be able to eliminate the coffee without affecting the texture or do i have to substitute something like molasses instead? 2. I have a heart pan that is designed to be the top layer of a cake (much like yours). Would I be able to use it? 3. Do you have a sense for how many cupcakes this would make? I was thinking of using heart cupcake molds and cover with ganache. 4. Can the cake serve 4 kids? I’d give them each a scoop of ice cream as well. 1. A good substitute for the coffee is warm water. Don’t skip the water, it will make the cake less moist. 2. I haven’t tried this in a heart pan. Is it 6″ across? 3. I’ve never used this exact recipe for cupcakes because I have other small batch chocolate cupcake recipes on this site, sorry! 4. Absolutely! It makes 4 mini slices of cake, perfect for kids! Awesome. Yes, the heart pan is 6 inches across and 2 high. I’ll check out the chocolate cupcake recipe. Thanks again. I think you’re good to go! I can’t wait to see! I want that mini heart pan, too! Can you please tell me about your cup measure in grams? 1/2 cup =? Grams or ml? Beng Acosta, I just want to say that I believe Christina’s temperature measurement is in Fahrenheit and you are referring to Celsius. Christina, I was given a little 6-inch cake pan, 3 inches high, and while searching the internet for small cake recipes, came across yours. I will attempt to make this and lower the heat as suggested by you to another enquirer. Thanks! Can I usr dutch processed cocoa for this cake? I wouldn’t…it has a different pH level and might affect the rise of the cake. I made this yesterday with a 7 inch round cake pan. It’s really hard to find a 6 inch cake pan here in Australia. It came out perfect but it does not look as good as your mini cake, it’s very thin lol. I will try to make the same quantity + half of all the measurement and see if it’ll rise. Even though you can’t have an Amazon Link, could you add a category of baking equipment including specifics , ie 2 inch high ,6 inch cake pan? A list would really be useful. This little cake looks so cute. And delicious. The pomegranate on top look great too. Perfect color for Valentines! Do I have to use sour cream in the recipe? My husband is allergic to whey and can’t hsve super creamy dairy items. CAn I substitute anything else or just leave it out? I also didn’t have cream or corn syrup, so for the ganache I halved this recipe: (https://www.itsyummi.com/making-chocolate-ganache-without-heavy-cream/) essentially, 1 tbsp butter, 1/8 cup milk, 2 oz of grated leftover Christmas chocolate (’cause it is March, so it’s time to be done with that!). Hi what can I substitute for sour cream? this recipe yielded a LOT of cake, like WAY more than i anticipated. nonetheless, it was delicious (even with substituting full fat yogurt for the sour cream) so i didn’t mind. thank you!! It was delicious!!! And I had to share it with unexpected visitors !!! For sure I’ll make it again thanks!! This chocolate cake is wonderful!!! I’m making it for the third time is week. Thanks!!! Oh my…this is perfect for what my son wants for his 4th bday. yup his request was a chocolate cake with chocolate icing and MnMs on top. And my family is not big on desserts (weird right! !, lol) so the size would be perfect for celebrating and finishing it in one go and not worry about just me on a cake binge (i would not mind it ;)). I have a 6inch cake pan with a 3 inch side but I could probably wing this!! LOVE LOVE IT!!! Can I use melted butter in place of the oil? I have made this cake and do love it, but somehow using oil bothers me. Sure, Teri, but don’t refrigerate the cake. The reason I use oil is so that the cake stays soft at room temperature or cold. Butter hardens when cold, and can make your cake firm and dry. Hi, there. I have made your vanilla cake and enjoy it. It is pretty different from other cakes as it is very dense. Now I am planning on make both vanilla and this chocolate cake. Besides, the obvious addition of chocolate, this chocolate cake recipe is different from the vanilla by adding sour cream, less flour, and oil. Will this cake me lighter in texture than the vanilla cake or about the same. If I wanted to bake a yellow cake this size, would I just omit the cocoa? Hi Annette, I have a vanilla cake for two recipe here: Enjoy! Hi Christina, I found your recipe on Youtube and then found my way here. Is it absolutely necessary to use sour cream? Is there a substitute you would recommend? I made this tonight with a few modifications and had a great result. Yes, you can use Dutch-processed cocoa for a darker chocolate flavor. Use the same amount of cocoa as provided in the recipe, but replace the 1/2 teaspoon baking soda with 1 teaspoon baking powder. This will keep the cake’s pH balanced. Had a wonderfully level cake without cracks or sink-holes. Very moist without being dense. Also, I baked this in a 7-cup (1.65 L) Pyrex storage bowl. Sorry, but I already have too many cake pans for my small kitchen. Just reduce the bake temperature by 25 degrees and increase the bake time by about five minutes. So glad to have found a decent recipe for smaller portions! Thanks for sharing. Hi Christina! I notice a lot of questions about the 6-inch cake pans–but I’m wondering if I can make this in my mini 4-inch pans and bake for less time? Or would I need to multiply the recipe? Thanks! Can I use butter milk instead of sour cream? I haven’t tried that, but you should be able to. This is my second time making this cake. The first time I drizzled icing on the cake. It was great! This time I did the ganache. We will be trying this tonight. I know it will be great. Thank you for this recipe. I substituted the sugar with the same amount of stevia granulated sweetener. Hope it tastes alright. Trying to reduce sugar intake. Wow, this really is the perfect little cake! I used Scharffen Berger cocoa, reduced the sugar to 1/3 cup, and added 1/4 tsp. almond extract. I baked it in a 6″ x 3″ cake pan, wrapped with a cake pan strip. I didn’t have pomegranate arils, so I garnished with fresh raspberries and sliced almonds. It’s the same thing :) Go for it!